Back on May 25th, Google released a browser add-on that stops (prevents) a users data from being sent from their computer when they visit a website that uses Google Analytics tracking. This add-on works for Internet Explorer, Firefox, and Google’s own browser – Chrome. Of course, Google wants to be in the forefront of user privacy and at the same time providing website owners with more data so they can spend more promotional money with Google such as on Google AdWords or enterprise versions of some of their other “products”. Remember the pop-up window? It wasn’t too long before enough people complained and browsers started blocking pop-ups by default and of course many greedy or unethical website owners were using the pop-ups for evil as well. 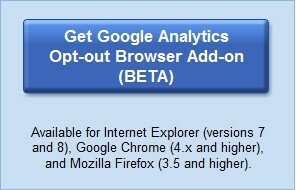 Now, I am sure that many web surfers don’t know about this Google Analytics blocking add-on at this time, so not much to worry about today, but what it brings to my mind is that of what would happen if it became a default standard for browsers (or some advanced virus protection software) to block Google Analytics, Omniture, or any of the other common Analytics tracking programs, in the name of improving user privacy? What about if enough of a percentage, unknown to you choose this down the road, how reliable will your data be?